You all know by now that Pantone’s color of the year is Emerald Green. But what you might not know is that PANTONE Universe’s Color of the Year, Emerald Green, is available exclusively at Lowe’s in Valspar Signature Paint. Did you know that? Well now you do and you are so much better off for it! 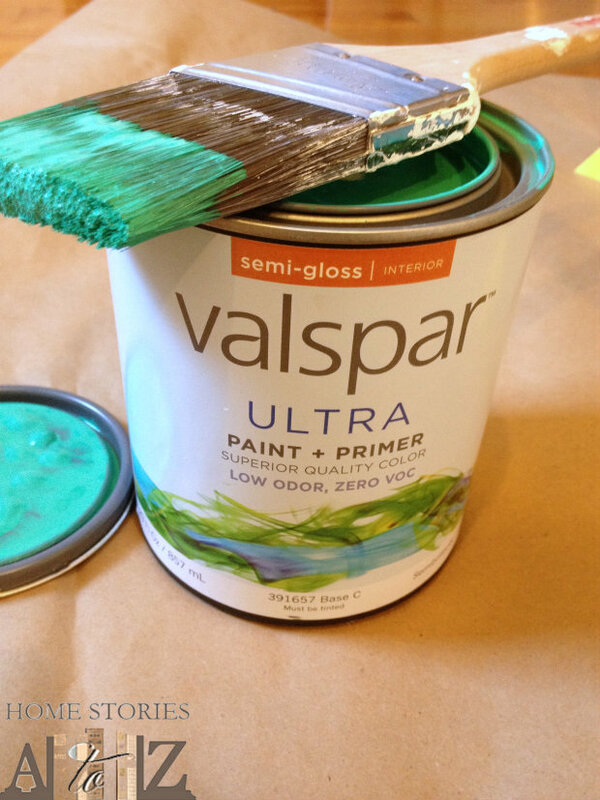 Right now Emerald Green is only available in the Valspar Signature-line, but you can easily have it color-matched in the Ultra-line which is what I chose to do. If like me, you gravitate towards neutrals when decorating, consider mixing things up this season by adding a bold pop of color to your room. 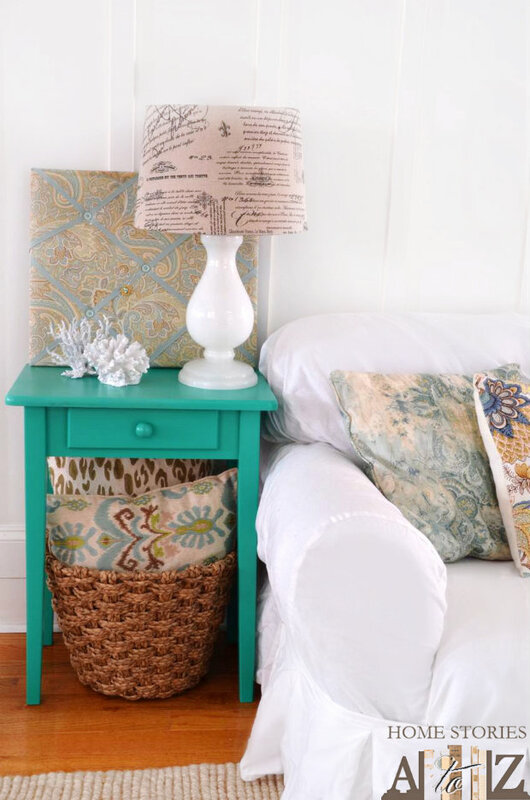 Using Valspar’s Emerald Green on my end table creates a fun focal point without overpowering the rest of the room. I love how the emerald green compliments the other sea-toned colors in the room. You might notice that Pantone’s “emerald” has a lot of blue to it. It’s a very bright color and not typically what I think of when I hear “emerald”. Although the color might not be for everyone, it is definitely eye-catching and looks great in small doses. I used an old nightstand for this project that was in pretty sad shape. This was one of the first pieces of furniture I ever purchased as a newlywed. We needed nightstands for our bedroom and blonde furniture was all-the-rage back then. I bought two of these mission-style tables from Target in pale blonde and they served us well. About five years ago, when I began blogging, this piece of furniture went through another “first” with me. 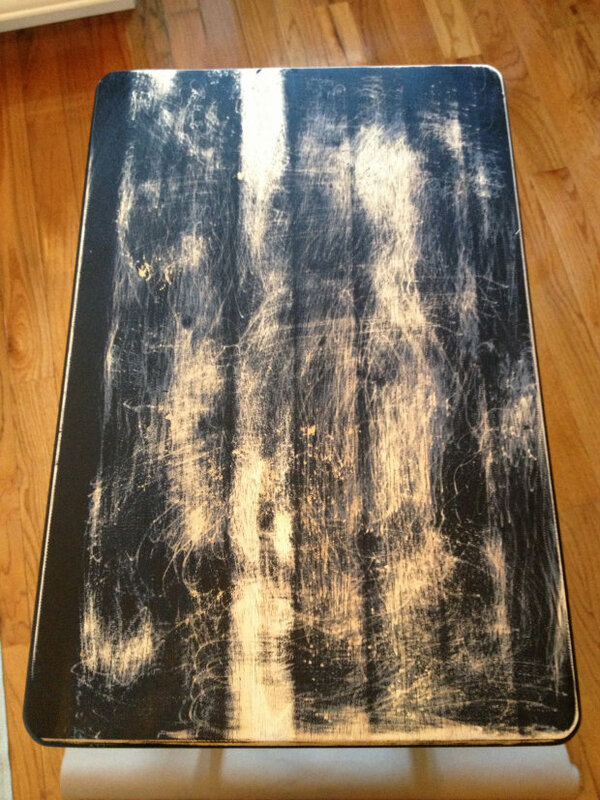 It was one of the first pieces of furniture I ever spray painted—and it shows. 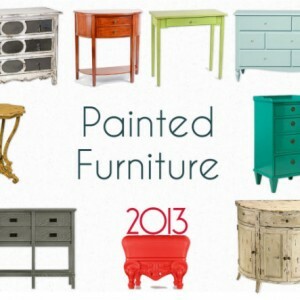 Back then everyone was using either black spray paint or heirloom white to color furniture. I had placed contact paper on the top and it left a gluey mess which needed to be sanded. I might have gone a bit crazy with my palm sander :). It looks worse than it actually was. 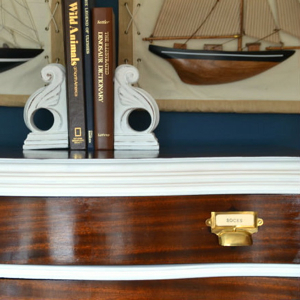 I chose to paint my piece with two coats of Valspar’s Ultra Paint + Primer in semi-gloss. It went on smoothly, hid all of the ugly black, leveled nicely, and left me with a lovely finish. This little pop of color was just what I needed to give my living room a fresh boost this season. 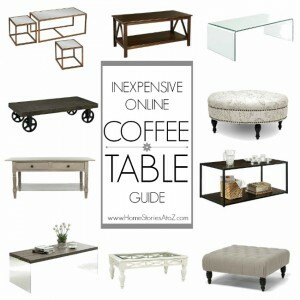 You can find my table featured in the online May edition of Lowes Creative Ideas using the iPhone or iPad app! 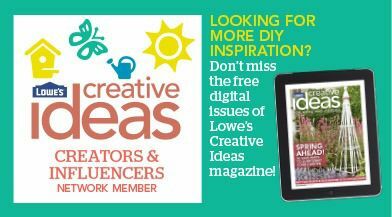 You might also want to sign up for Lowe’s Creative Ideas Magazine. It’s FREE and offers a bunch of DIY inspiration. Go ahead and connect with Lowes Creative Ideas to follow along with what other creatives are up to each month! 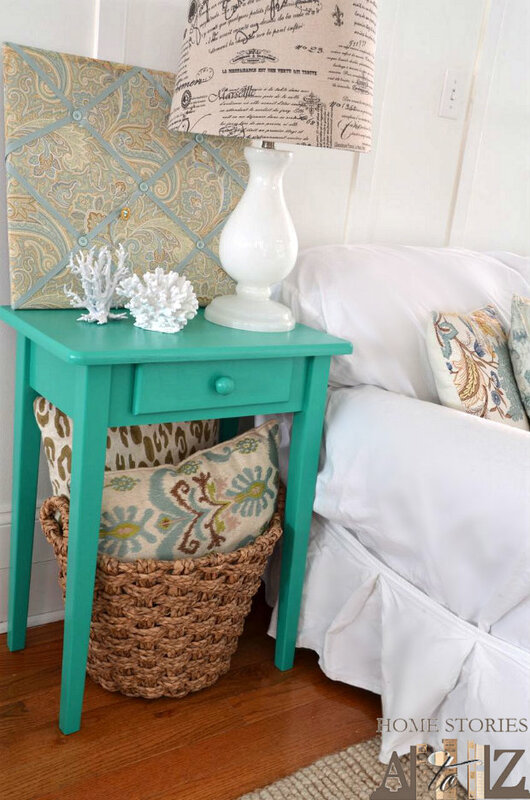 This table is gorgeous and you did an amazing job at adding a pop of emerald color in a room without overdoing it. LOVE! Thanks so much Kate :)! Beautiful color! I have an end table in our living room that needs paint. Maybe this will be the color! I think those table legs are begging to be ” dipped” in gold! gorgeous color!! I love it! I, too, took the emerald plunge. I used Behr’s ‘Precious Emerald’ and painted two campaign night stands that I rescued from the trash heap. They were in terrible shape before and required a lot of prep work, but they turned out beautifully and I love the way they look against the soft, lavender color in my daughter’s room. 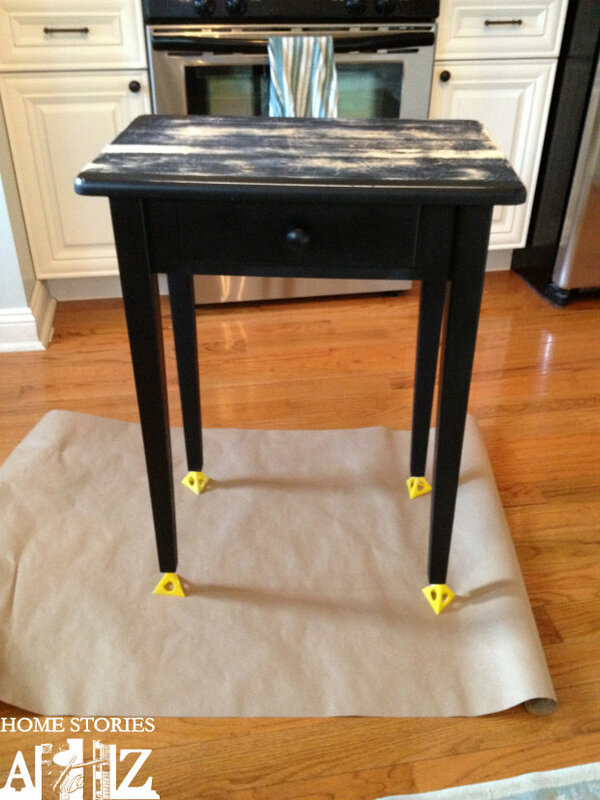 Where did you get those yellow pegs to put your furniture on when painting? I’m sure we will! It’s all part of the fun of trends :). 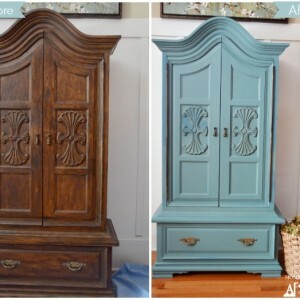 I’m about to start an end table makeover and this color just might be my choice! It looks gorgeous! Thanks for the inspiration!